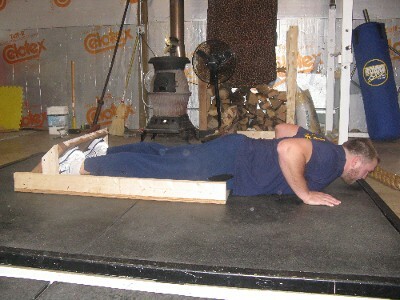 Below are a few pictures of a useful (homemade) hamstring apparatus.Â The images and video are courtesy of Dane Miller at Garage Strength (who has been fortunate to train alongside Dr. Anatoli Bondarchuk). Cut a piece of plywood at a length of 4â€² (this is factory width) and then cut the desired widthâ€¦we used 31 in. Cut an 8â€² 2Ã—4 in half so u have 2 4â€² pieces. Screw the 4â€² 2Ã—4 along the 4â€² sides of the plywood. Make sure that the 2Ã—4 is uprightâ€¦ screwed on the 2â€³ side. Cut a piece of 2Ã—4 to screw to the upright part of the angled plank for stability and strength. Another simple option is to take one of those ‘door frame’ type pullup bars and jam it in at the bottom of the door instead. Hook your heals and put a pillow under your knees and your ready to go! Have to get hubby to make one up. Used GHD for 1st time recently & loved the challenge. Love those Glute Ham Raises. Learned them from reading Infinite Intensity. Made a huge difference in the muscle balance in my legs. Prior, I believe I was out of balance regarding quads (very strong) and hamstrings (relatively weak). Thanks. I love the homemade equipment! However, I just want to pass this along – don’t let some woodwork stop you from doing GHRs! I use the underside of my car to jam my feet under. Learned that trick on the forums here. Towel under the knees, works great. Good stuff man. I have spinal injuries so I have to come up with innovative ways to train my legs: step ups, Bulgarian splits, sissy squats and Ham glute raises are now my mainstay instead of getting under the bar. I’ve built up stronger core and stabilisers since my back injuries and spend more time now on balance and coordination.